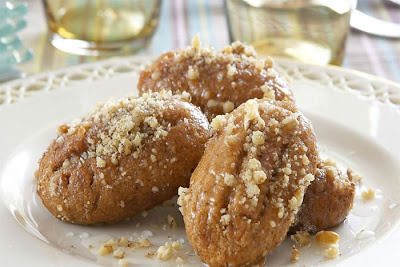 ModeliciousBites : Melomakarona.Greek Xmas Recipe. Melomakarona are a traditional Christmas treat in Greece.We found the best recipe with 276 calories.You can choose brown sugar and brown flour for less than 276 calories. ***The cooled cookies will be dipped in the hot syrup, so don't start the syrup until the cookies have cooled. Preheat the oven to 320F (160C) with a convection oven, or 350F (180C) with a conventional oven. Dissolve the baking soda in the orange juice. Put all the dry ingredients (flour, semolina, sugar, spices) in a bowl and mix until blended with a whisk. In the middle, create a well and add the liquid ingredients (oil, brandy or flavoring, orange juice). Knead the dough until it sticks to your hands. To shape the cookies (see photos), take a fistful of dough and make it into a log. Press the dough gently with your fingers on one side to flatten slightly. The shape of the cookies can be rounded, oval, or a small log shape. Place the cookies well spaced in a greased cookie sheet (or on parchment cooking paper, or on a non-stick cookie sheet), place on the middle rack in the oven and bake until browned (about 15-20 minutes}. Remove from the oven and allow to cool on baking racks. Put the water, honey, sugar, cinnamon stick, and cloves in a wide pot (like a deep frying pan) and bring to a boil over medium-high heat for 2-3 minutes. Turn the heat down to low. (As soon as it starts to boil, a foam rises to the top - scoop this off and throw it out.) Remove the cinnamon stick and cloves. Put in cookies (as many as will fit on the bottom) into the hot syrup and use a spatula to hold them down for about 45 seconds to a minute, depending on how syrupy you want them to be. Once the cookies have been soaked, remove them with a slotted spoon, letting some of the syrup drip, place on a large serving plate in layers, sprinkling each layer liberally with the finely chopped walnuts before adding another layer on top. Melomakarona are not refrigerated. Cover them well with plastic wrap or store in tins so they don't dry out, and they'll last for several days - if they aren't eaten by then.